In 2015 the Wipeout-inspired racing game Redout was announced for consoles by publisher 505 Games and developer 34BigThings, though no release date was confirmed at the time. Now the studio have launched a new trailer for the console release of the game, with a confirmed retail release date. Redout is a racing game with a difference, much like the Wipeout series. Players control ships instead of cars, and fly them around gravity-defying tracks at high speeds, avoiding terrifying falls, making death-defying jumps, and feeling the incredible rush of winning. Redout will launch for Playstation 4 and Xbox One on August 29, 2017 in the United States, and August 31, 2017 in Europe. 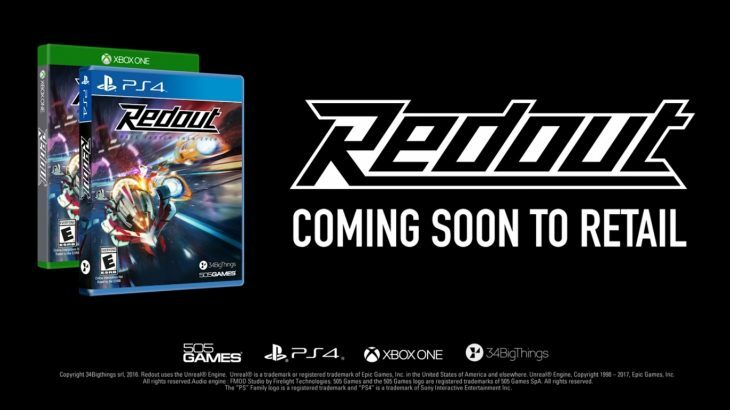 The version coming to consoles is named Redout: Lightspeed Edition, which bundles together the original PC release of the game, as well as the two DLC packs that have launched since, meaning in total it contains 30 tracks for players to race on. 34BigThings have also announced that the game will have a new split-screen mode, confirming local multiplayer. Finally, the Lightspeed Edition will include an exclusive skin to be used on ships. The racing games that inspired Redout have long been gone from gaming memory. The Wipeout developer, Sony Studio Liverpool, shut down in 2012 after 17 successful years of operation. The last Wipeout game to launch was Wipeout 2048 for Playstation Vita, which released in the same year the company closed. Five years later we are finally seeing the return of the series this month with Wipeout Omega Collection for Playstation 4, created due to popular demand. Other inspirations for Redout such as F-Zero are still missing from current generation consoles, and it’s unlikely they’ll return with Redout filling the void that they’ve left in the racing genre. The problem with these older racing games is that they were exclusive to Nintendo, Xbox, or Playstation consoles, which won’t be the case with Redout. 34BigThings have also confirmed that they’ll be bringing Redout to the Nintendo Switch on July 26, 2017, just over a month earlier than PS4 and Xbox One. The Switch is an incredibly popular console this year, so it makes sense that the developers would want to give it a priority, and release Redout for it as soon as possible.